If you are looking for a company that can design and manufacture elegant and durable curtains, DOME is where you need to come. 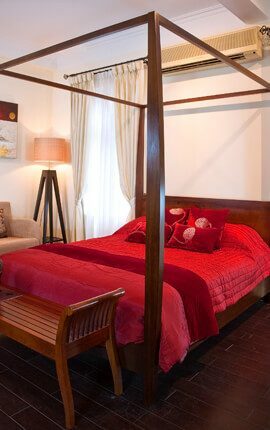 We have more than 20 years’ experience in curtain design, manufacture and installation. DOME’s curtains are designed and made according to European function and finishing standards, and especially, the embroidered organza curtain is one of DOME’s highlight products, is the pride of the DOME. DOME makes curtain for the main hall of Hilton Hotel, many foreign embassies in Hanoi, as well as serves many Vietnamese fastidious customers. DOME offers measurement service, construction survey, consulting and design the perfect window covering according to your purpose and budget. DOME’s standard curtain is usually double-layered. 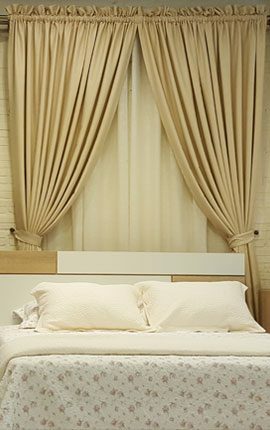 Outer curtain is made from thick cloth, usually added with one more layer of satin or blackout lining. Outer curtain layer has the ability to cover as well as beautify the doorframe, which help create luxury and delicate living space. 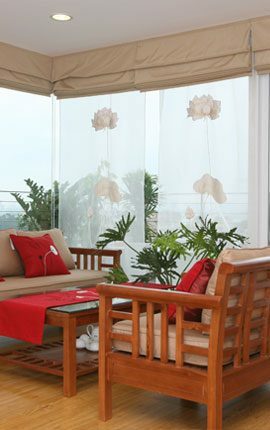 Inner curtain is made of sheer or organza. This layer has high decorative purpose. 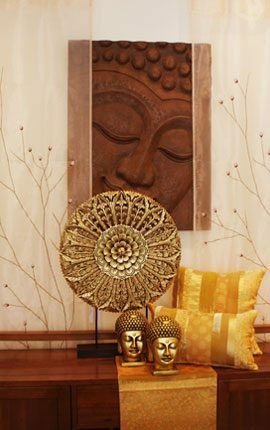 It can be a highlight or bring about a soft, romantic look to the room. 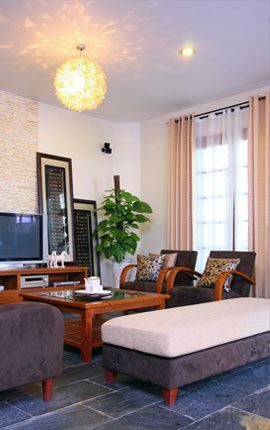 DOME has a variety of curtain fabrics imported from countries such as Belgium, Indonesia, Thailand, Japan, Korea etc., which can suit our customer’s hobbies and living space. DOME’s curtain cost includes full on-site installation and a 12-month warranty. Classic and luxurious. On the top of the curtain, the tailor skillfully shapes the fabric into beautiful goblets. 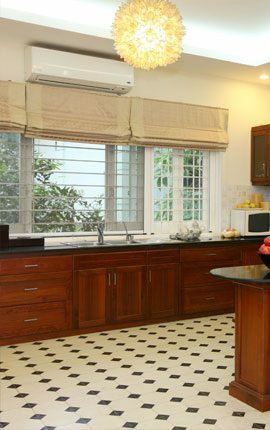 This type of curtain is suitable for large living space and high ceiling with a quite reasonable budget. The most popular classic curtain. This curtain is simple but elegant with fixed pleats on the top of the curtain. Curtain with double pinch header is suitable for almost any spaces with classic or modern style, with moderate budget. This curtain is graceful, lovely and romantic. It is suitable for different spaces, with winged window opening outward. The budget is moderate. The most popular curtain. This curtain has modern style, easy to use while still gentle and luxurious. 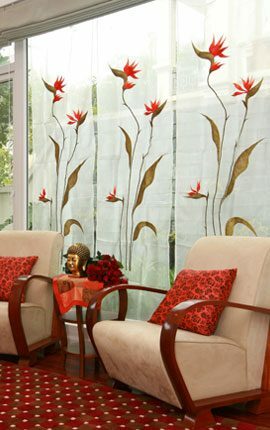 This type of curtain is suitable for all spaces, especially modern style furniture, with reasonable budget. A kind of curtain with layered fabric. This curtain is simple, neat and suitable for small space, small door, working room, bathroom, children room ... Roman blinds in particular has the lowest cost of all kinds of curtains. 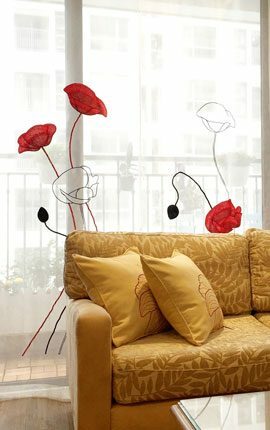 This kind of curtain is not too sophisticated, however, it is very lovely and cute. With this kind of curtain, you can create a bit of graceful touch for your room by combining different colors on the curtain. 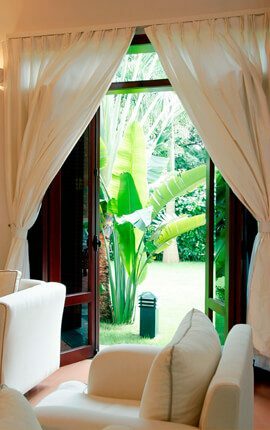 This type of curtain suits to winged window opening outward. Budget for curtain with tab top is moderate. Behind our popularity with the beautiful embroidered tab panel curtain collection today, it is the constant creation of DOME’s design team as well as our not – afraid – attitude to test so many samples with skilled embroiderers. 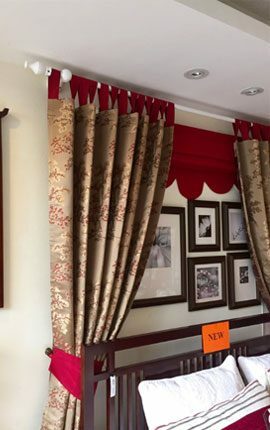 As a result, this curtain line is warmly welcomed by our customers. 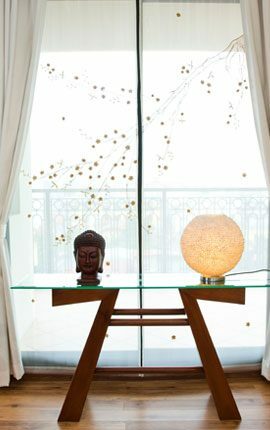 Many customers not only buy in order to decorate their home but they also turn it into the meaningful gifts for their friends, relatives; at home or abroad. 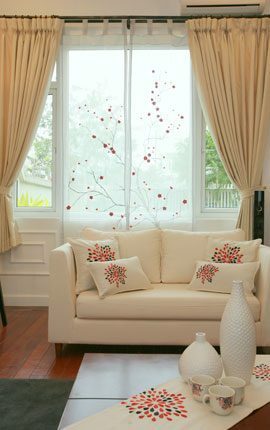 Embroidered tab panel curtain is often used for main space such as living room, dining room, master bedroom and worship room. It can be used as a single layer or can be combined with another layer outside such as goblet, double pinch or tab top curtain, etc.